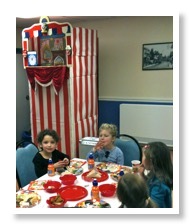 Why not book a Punch and Judy Show for your children's birthday. The Professor performs a fantastic show specially for these events. The proceedings kick on with a wonderful magic show. Children love magic and Dill's show is a skilful as well as laugh packed display of sleight of hand Things disappear from his fingertips, coins come cascading from children's ears. The birthday child gets to do their very own magic trick. After the magic show we move straight into the Punch and Judy show. The show is performed from a special indoor theatre which is suitable for smaller spaces, so it can be set up in a lounge for example. The show which is suitable for children of any age, is a fast paced slapstick comedy with all the well loved characters, Toby the dog, Joey the clown, the baby, the policeman and of course the crocodile who makes off with Mr Punch's sausages. 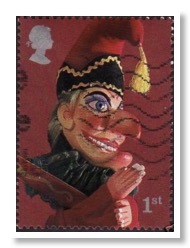 The whole show, including the magic, lasts about forty five minutes, and is an absolute riot of audience participation - please go to the Punch and Judy Video page to see a few clips. Professor Dill can provide a complete package for your children's birthday party. Everything you need for a magical birthday party for your child - all you have to supply is the food! First comes the magic show. Coins are produced from children's ears, objects appear and disappear in a comical and bewildering fashion. Having worked as a full time professional sleight of hand magician for many years, you can be sure you will be getting the most amazing display of magical expertise. Not only will the children be amazed but the parents will be too! During the magic show the birthday child also gets a chance to do some magic of their own. Balloon modelling is another speciality, with a few deft turns a balloon magically turns into a dog, a rabbit, a flower or even a pirate sword. Every child gets to go home with their very own balloon model. No children's party would be complete without a little bit of music! If you only have an old CD player to hand hand then don't worry We can supply the perfect children’s disco for any venue - whether it be in your front room or a church hall. Disco lights a sound system plus is always a great attraction! Whether if be pop, disco or children's tunes for the younger party goers Dill can supply 100 watt battery powered sound system with special music mixes specifically designed for the perfect children's party. So when planning your child's birthday, think of magic, music and a fantastic puppet show. Talk to a professional entertainer - give the professor a call!